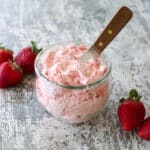 Whipped Strawberry Honey Butter is fluffy, creamy, sweet, and buttery goodness in a pretty pink package. This is amazing on toast, scones, pancakes, popovers, muffins, breads, and just about anything else you might want to butter! I’ve been a big fan of Vanilla Bean Whipped Honey Butter for years, but this strawberry loveliness just plain puts it to shame. 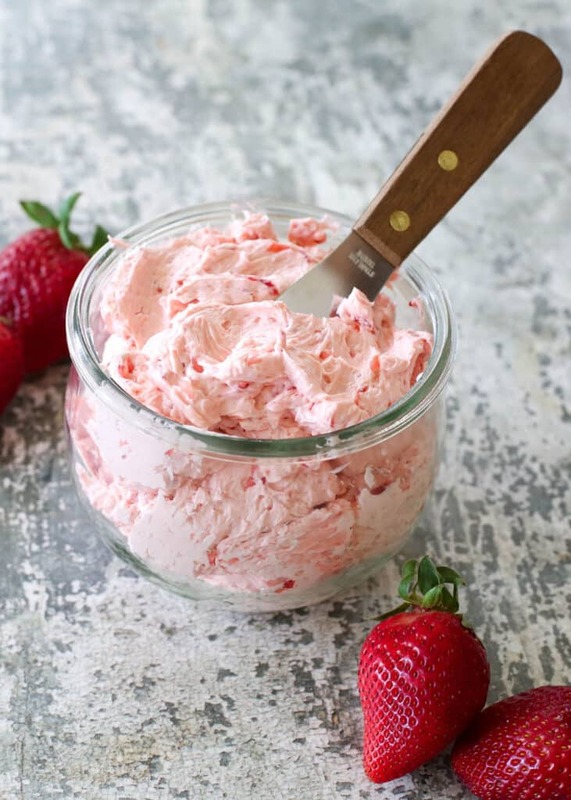 Slathered on toast, on biscuits, on scones, or even on a graham cracker, this Strawberry Butter is pure heaven. A while back, I spent a long weekend playing in the sun and enjoying some fun and relaxing downtime with two of the best friends a girl could ask for. 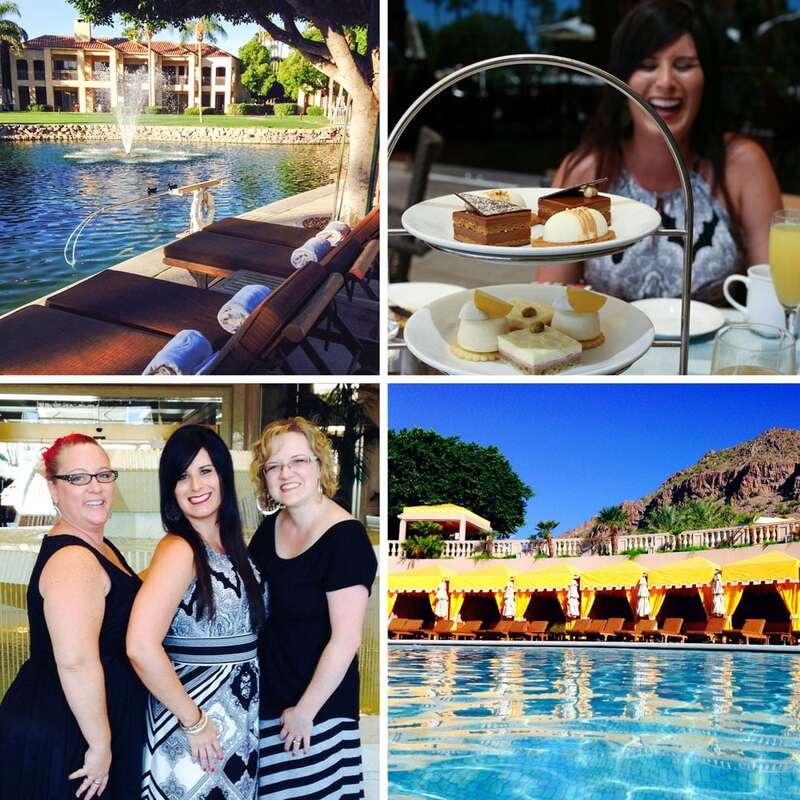 We stayed at the gorgeous Phoenician resort in Scottsdale, ate as much amazing food as we were able, and greatly enjoyed being waited on and pampered all weekend! On Saturday, we wandered out to Scottsdale Fashion Square and finished our morning with lunch at NM Cafe in Neiman Marcus. I hadn’t eaten there before, and in case you haven’t either, I’ll tell you that our favorite part of the meal was the little dish of strawberry butter and the popover that they brought out while we waited for our meal. I knew that amazing butter would be re-created in my kitchen just as soon as I got back home. On our way home on Sunday night, we stopped at the store for strawberries. Before I even unpacked, I’d made three different batches of strawberry butter. The recipe I’m sharing was hands-down our favorite. I loved the difference the honey and the fresh berries made! Kitchen Tip: I use this mixer, these bowls, and this jar to make this recipe. Place the butter in a mixing bowl and beat on high speed until fluffy, at least 3 minutes. Scrape the sides as needed. Add the smashed strawberries and their liquid to the butter and beat again until combined, about 2 minutes. Add the honey and beat until light and fluffy, about 2-3 more minutes. Transfer to an airtight container and refrigerate until needed. Let soften at room temperature for a few minutes before serving. Enjoy! If you'd like a shortcut version, we made a strawberry jam butter (2 parts butter to 1 part jam) and it was delicious as well. 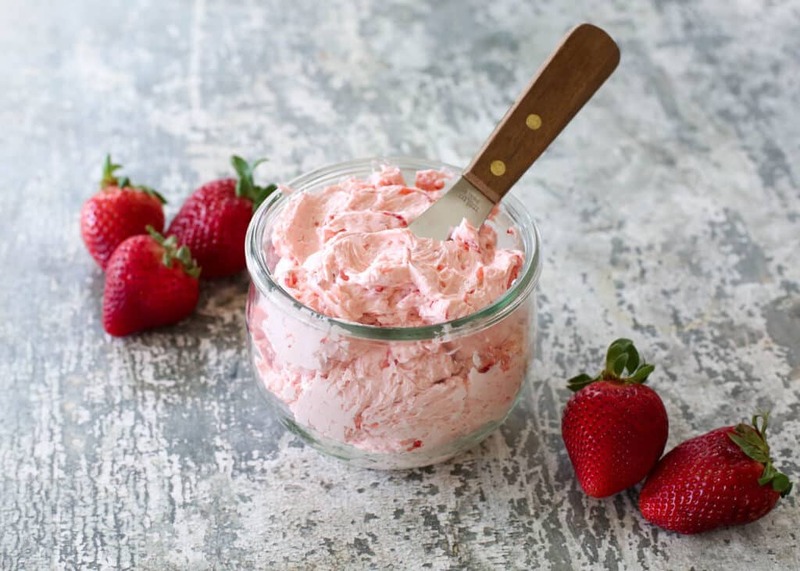 For the flavor closest to NM Cafe's strawberry butter, whip the butter and berries and then add white sugar slowly, tasting as you add it, until it is as sweet as you like. How's that for giving you plenty of options? I use salted butter when making this recipe. Feel free to use unsalted and add a pinch of fine sea salt as needed. I've never tried that, but it should work fine. I'd thaw them and maybe even squeeze them in a paper towel if they are watery. Can this be formed into small butter balls? HONEY INSTEAD OF SUGAR, SO MUCH BETTER, I LOVE STRAWBERRY BUTTER.EVEN ON A BISCUIT OR CRACKER. YUM. THANKS FOR SHARING. Have you tried with other fruit besides strawberries? I've made this with raspberries as well. Enjoy! I would not use one cup of butter again...took over the strawberry flavor...remade with half the butter and honey and the consistency and taste were better!! WHAT KIND OF BUTTER DID YOU USE? I USED KERRY GOLD STICK AND IT DID NOT WHIP EVENLY. SHOULD I HAVE USED A WHIPPED BUTTER OR MARGARINE. I use regular salted butter. If it wasn't soft enough, that might have affected it. It should last at least a week in the refrigerator, Karin. Question... In the video it looks you used 1 stick of butter but the recipe calls for one cup which is actually 2 sticks of butter. Which one is correct? Thanks! I made a half recipe for the video (which I may never do again, as it tends to cause confusion. LOL) Live and learn. It's one cup of butter for the recipe as written. Enjoy! 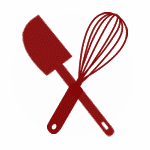 If I wanted to make raspberry butter what measurement of raspberries would you recommend? A 6-ounce container of raspberries should work well for this recipe, Nancy.